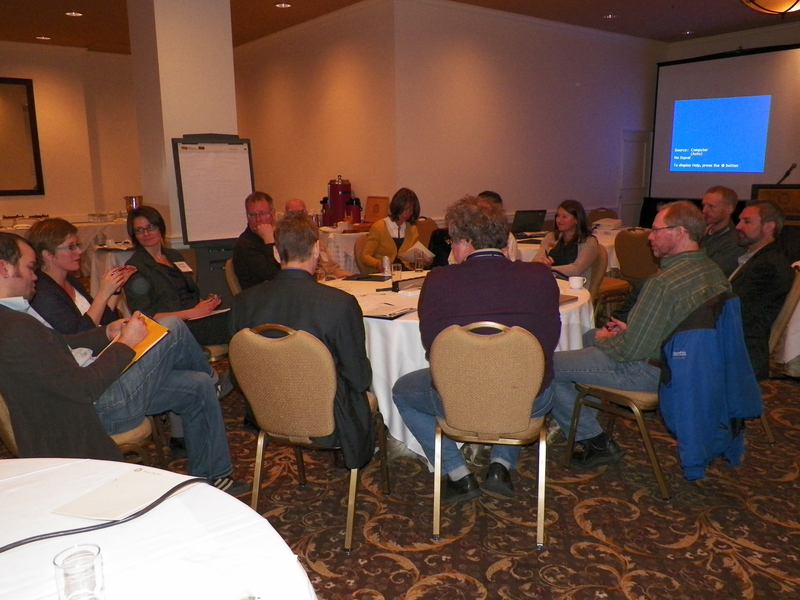 BALTA researchers meet at the January 2012 BALTA symposium to discuss plans for future research. Photo credit: Stuart Wulff. Canadian Centre for Community Renewal CCCR is a non-profit organization committed to crafting solutions to the challenges stemming from climate change and peak oil. CCCR was the founding lead organization for BALTA and continues to play a co-lead role. Athabasca University – AU is Canada’s Open University, dedicated to providing open access to learning through distance education programs. AU is the host institution and a co-lead organization for BALTA. Sustainable Calgary SC is a citizen-led, non-profit organization that promotes citizen engagement in initiatives that move Calgary towards a sustainable future. SC is a co-lead organization in BALTA’s SIS Project. Gustavson School of Business and the Centre for Co-operative and Community-Based Economy, University of Victoria The Peter B. Gustavson School of Business is an internationally accredited business school located at the University of Victoria. CCCBE promotes interdisciplinary research and learning on subjects related to co-operative & community-based economy. Gustavson School of Business and CCCBE is a co-lead organization in BALTA’s SIS Project. ACSRC promotes interdisciplinary and collaborative research, policy engagement and partnerships between the University of Alberta and rural communities. British Columbia Co-operative Association BCCA is the umbrella organization for B.C. co-operatives and credit unions. Alberta Rural Development Network ARDN is a network of Alberta post-secondary institutions to provide research, knowledge and training for Alberta’s rural communities. Climate Smart Businesses Inc. CSBI is a for profit business providing training and software tools for businesses to measure their carbon footprint and identify opportunities for cost, energy, and carbon reduction. Centre for Sustainable Community Development, Simon Fraser University CSCD is a teaching and research unit established to encourage sustainable community development. ERSC fosters interdisciplinary research and information dissemination to contribute to environmental discourse in society. ECF, part of a network of Canadian community foundations, acts as a bridge between donors and greater Edmonton charities to help create and maintain a strong, vibrant community. Hull University Business School – This UK based academic partner brings an interest in the application of complexity science to climate change adaptation. Enterprising Non-Profits, VanCity Community Foundation – enp is a collaborative funding program that provides grants and technical assistance to non-profit organizations to support development of social enterprises in British Columbia. Enp also plays a leading role in promoting social enterprise nationally and internationally. ISIS Research Centre, Sauder School of Business, University of British Columbia – ISIS is focused on leveraging business tools to advance social innovation and sustainability through research, incubation, and application. Marsden and Slaithwaite Transition Towns Co-operative – MASTT is based in Yorkshire, UK, and is part of the wider Transition Towns Movement. Karl Polanyi Institute of Political Economy, Concordia University – The Institute encourage dialogue and new intellectual work inspired by the legacy of the economic theorist, Karl Polanyi. Mennonite Central Committee BC – MCC BC is one of six provincial MCC offices in Canada. MCC is a worldwide ministry of Anabaptist churches, which works to respond to basic human needs and for peace and justice. MCC BC supports local programs and programs in other countries. London School of Economics, Civil Society and Human Security Research Unit – CSHSRU conducts research and education that focuses on the role of civil society in shaping decisions that affect their lives with a focus on human (i.e. individual and community) security. New Economics Foundation – The UK-based nef is an independent think-and-do tank that promotes innovative solutions that challenge mainstream thinking on economic, environment and social issues. nef’s Great Transition Project is promoting a new economy that works for people and planet. Royal Roads University – RRU offers a blended model of post-secondary education involving online distance education with on-campus residencies. Environment & Sustainability is one of its major programs. It also supports research related to its program areas. Réseau canadien de développement économique communautaire / Canadian Community Economic Development Network – RCDEC/CCEDNet is the umbrella organization for community economic development (CED) organizations and practitioners in Canada. St. Joseph’s Theological College, University of Alberta – St. Joseph’s is a Catholic theological college. It supports education and research from Catholic and ecumenical theological perspectives. Sustainability Solutions Group – SSG is a worker co-operative that brings together leading sustainability professionals. SSG collaborates with clients to develop meaningful, creative strategies to integrate ecological, economic and social sustainability in their projects, organizations and communities. Selkirk College Regional Innovation Chair in Rural Economic Development – The RIC conducts research on rural economic development. Priorities for research are determined in collaboration with partners, including local and regional organizations and businesses. University of Alberta Faculty of Education, Department of Educational Policy Studies – EPS is a multidisciplinary department that explores educational policies and practices as they pertain to leadership, society, culture and life-long learning. University of Alberta Faculty of Extension – Extension serves as a community portal, both to and from the University of Alberta, dedicated to lifelong learning activities and research that promotes leadership, discovery, reflection, communication, and service. University of Salford, Community Finance Solutions, School of English, Sociology, Politics & Contemporary History – CFS, based at the UK’s University of Salford, is an independent research unit specialising in financial and social inclusion, and community asset ownership. It offers independent research and advisory services to social landlords, local authorities, national government, charities and other organisations and agencies.